This card depicts what one would imagine the last judgment would be, in the various forms that takes in many mythologies. 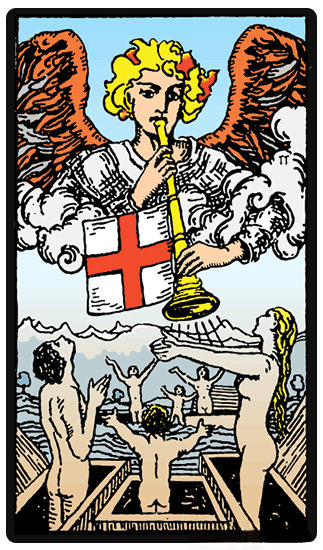 The image in the Judgement card shows women, men, and children who are rising from the grave to respond to Gabriel s trumpet call. Their outstretched arms symbolize that they are ready to be judged by the universe. They are about to meet their creator, their actions weighed, and find out where they will spend the remainder of eternity: in heaven or in hell. The massive tidal wave in the background signify that judgement is unavoidable, and that this judgement will be final. Judgement is ruled by Pluto, who is the underworld s ruler. There are echoes of this card in Death, for they both remind us that everything comes to an end and that a new beginning is coming.